I was an easy target, strolling happily towards the temple outside Inwa, Myanmar. The little Burmese girl chose me as the unwilling object of her relentless sales pitch. Clinging to my side she chanted loudly, “Lady! Lady! You buy my earrings? Buy my earrings! Lucky money! Lucky money!” She recited these words over and over in exactly the same order, a mindless loop of singsong, all the while holding up a selection of cheap handmade jewelry. My polite refusals were completely ignored or perhaps she simply didn’t hear me. She absentmindedly stared off into space while repeating her jingle, daydreaming of being someplace else, any place else. She was clearly bored with her job but needed the money. As a seasoned traveler, I’d seen my share of touts. Overly aggressive to say the least, they will do just about anything to make a sale. I learned long ago to avoid eye contact. Keep walking. Say nothing to encourage them. But from the moment my plane touched down in Burma, I felt no need for such guardedness. 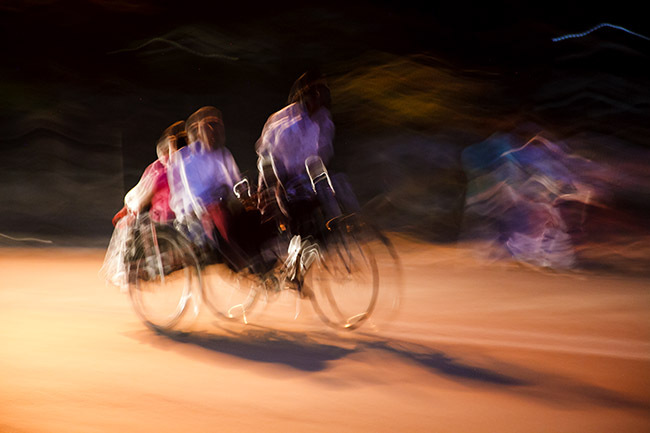 Getting to Myanmar (Burma) is a trip, but getting around while in-country can be an adventure. During 18 days of travel, we rode in human-pedaled trishaws, rickety horse-drawn carriages, vintage trains, and boats of every imaginable size, shape and color. Squeezed into crowded truck-busses, we joined indigenous commuters, and used the smattering of Burmese phrases we picked up along the way to interact and become part of their day. In turn, they became part of our memories. Much more than transportation, these conveyances provided an intimate glimpse of everyday life, a profound sense of place, and an authentic connection to this rapidly changing country. Traveling with Eldertreks, an adventure travel company for travelers 50 and older, my wife, Judie, and I were able to step outside the tourist bubble and travel with the locals.